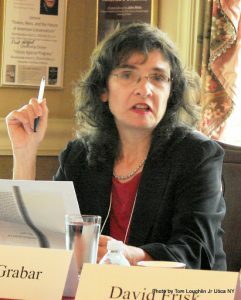 The Alexander Hamilton Institute for the Study of Western Civilization (AHI) congratulates Resident Fellow Mary Grabar on the publication of “The Diversity Hokum: The ‘Disappearing’ of George S. Schuyler,” in Diversity, Conformity, and Conscience in Contemporary America (Lexington Books, 2019). The volume is edited by Bradley C.S. Watson, the Philip M. McKenna Chair in American and Western Political Thought, St. Vincent College, where he is also Co-Director of the Center for Political and Economic Thought. The volume derives from the 2015 biennial Culture and Public Policy Conference, sponsored at Saint Vincent College by the Center for Political and Economic Thought in cooperation with the Alex G. McKenna School of Business, Economics, and Government. Contributors include Ryan T. Anderson, Matthew J. Franck, Bruce P. Frohnen, Kenneth L. Grasso, Joe Knippenberg, Alan Charles Kors, Phillip Munoz, and Jeffery J. Ventrella. Grabar’s essay builds on years of research into the life of George S. Schuyler, the prominent African-American journalist and novelist (1895-1977). Schuyler fought conformity, censorship, racial separatism, and the communist threat during his 50-plus-year career as an editor and columnist at the Pittsburgh Courier and as a writer, speaker, and radio host. Her essay focuses on how the academic gatekeepers, especially in African-American studies departments, have erased the historical record and “disappeared” the once most-read and highly regarded African American journalist in the country. Her biography of Schuyler will be published by Northern Illinois University Press. Dr. Grabar’s years of hard work on these topics are now bearing fruit. AHI could not be more pleased it has supported her in bringing this important work to the fore.